There are some great performances up on Kickstarter this month, and I am so happy to see more of these types of projects. I had such a great time at the Edinburgh Fringe Fest in 2014 when I had an opportunity to see lots of awesome Steampunk and Victorian content. It is one thing to read a Steampunk book or even attend a convention, but being part of a rapt audience at a performance or film screening is a whole other level of immersion. Keep it coming creators! What’s Going on in November and December? Absinthe Heroes is a propulsive, darkly humorous rock opera which both satirizes and celebrates the weird, wondrous world which is Steampunk. It’s got a gorgeous score by renowned Steampunk headliner Psyche Corporation, whose work has enthralled audiences all over the world. Absinthe Heroes has been described as “a riotous blending of the ridiculous and the sublime”; “mad science in theatrical form”, and “A Steampunk rollercoaster”. It’s chock full of surprises, plot twists, Easter eggs, and, just as things are starting to get seriously silly, it arcs into exhilarating drama and storytelling. My Favorite Reward: For a $15 pledge, backers can have their Steampunk business or event shared with 87,000 people who follow the Facebook page, as well as having an official Steampunk title bestowed upon them. Beard & Bean have entertained audiences on stage and screen. This two person comedy team entertains at conventions, expos and festivals engaging audiences in imaginative game shows, creative discussions and adding humor to informative panels on a variety of subjects. Beard and Bean become fan favorites and are repeatedly asked back to events year after year. In 2015, after meeting with Doc Phineas, a Steampunker from Pawn Stars, Beard & Bean have been offered stage time at Steamathon 2016 in Las Vegas. What a great way to premiere two new shows for 2016! Currently there are two stage events in development: Micheal Faraday’s Life of a Candle and Beard and Bean: Science Pirates. My Favorite Reward: For a $15 pledge you can get a thank you and a “stunt liver” bottle opener. My Favorite Reward: For 20 GBP you can get a digital download of the film before anyone else gets to see it. “WHO- Hi, I’m Sean Hoade. You may know me from my fiction and nonfiction books about zombies,Zombie School Confidential and Reviva Las Vegas!, my thriller Ain’t That America, my literary-historical fantasy Darwin’s Dreams, my unhinged collection of stories Inappropriate Behavior, my acclaimed horror-Edwardian mashup Deadtown Abbey, or my Lovecraftian trilogy, Cthulhu Attacks! My Favorite Reward: For just $10 you can get the game. “For years they have walked among us… the dashing heroes and their extraordinary adventures, the bold engineers and their amazing inventions, the resourceful and steadfast leaders who take our hands and lead us gently and humbly through incredible worlds. 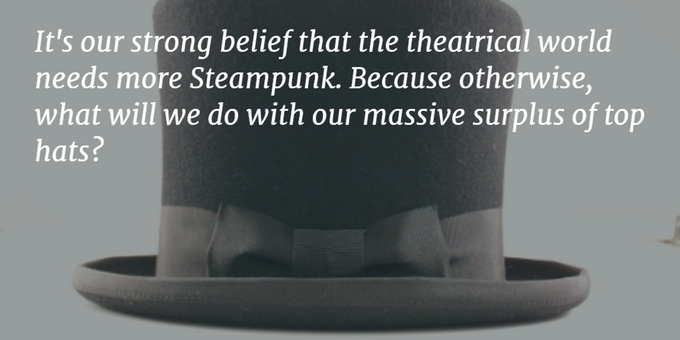 They are the pioneers, the Legends of British Steampunk. and now they are to become immortalised in the showcases of collectors and on the tabletops of gamers across this wide world. 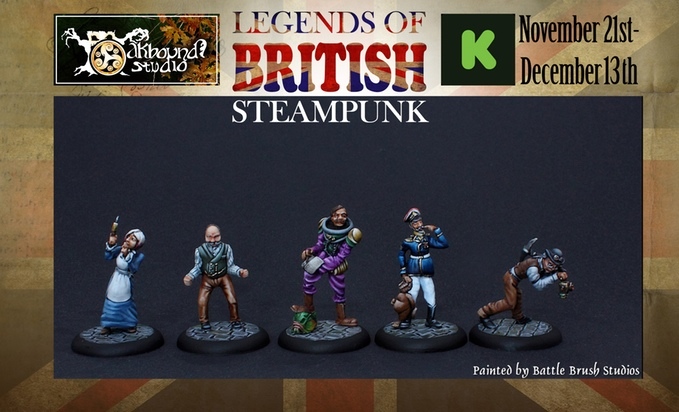 Ladies and Gentlemen, please be upstanding for the LEGENDS OF BRITISH STEAMPUNK! My Favorite Reward: For a pledge of 20 GBP you can get any set of 6 miniatures. These can be used for gaming or just to have on display, and feature some of the cool folks I met while I was on my Steam Tour last year. Phoebe Darqueling is a Steampunk-inspired blogger and artist who lives in California, but whose heart will always belong to Minnesota.